A couple of weeks ago, after my app review/giveaway with Super Duper Publications, I was contacted again but this time to do a product review! What was even better was they gave me a choice of what to review! 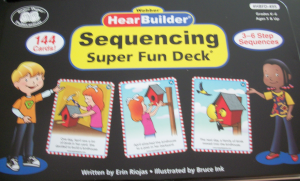 Due to the fact that many students on my caseload have difficulty with auditory processing, especially recalling directions and information from stories read aloud, I chose the new HearBuilder Sequencing Super Fun Deck! After I found out that I was getting the HearBuilder Sequencing Super Fun Deck to review and use with my students, I eagerly awaited the bright red package in the mail. Unfortunately, I had quite the difficulty getting the package but after receiving help from an amazing Fed Ex employee, I finally received the packagejust in time to use it with my students on the last two days of school! 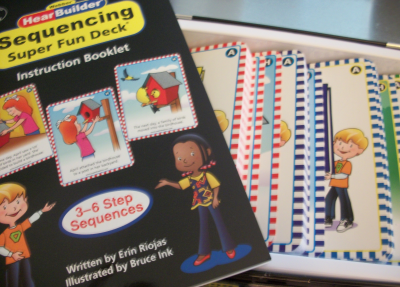 The Webber HearBuilder Sequencing Super Fun Deck contains 144 cards with 3-6 step sequences with text written by Erin Riojas and illustrations by Bruce Ink. This product is produced and sold by Super Duper Publications and is great for Grades K-6 (ages 5+). The HearBuilder Sequencing Super Fun Deck has 8 stories (labeled A-H) for each of 4 sets (colored red, dark blue, light blue, and green). Each set increases in difficulty from 3-step sequences to 4-step, 5-step, and 6-step sequences. These stories come with a card which shows the title of the story and then the steps. In addition, each card has two sides. The front contains the story and the back is the Instructional Side. The great part about this Super Fun Deck is that it can be used with students at many different levels. With Kindergarteners who cannot read yet, they can view the pictures to place the story in order. 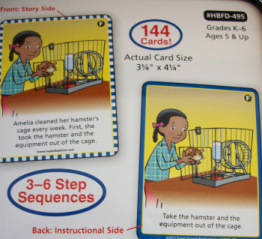 For students who need concrete step-by-step sequencing, use the Instructional Side of the cards. For students who have difficulty placing events in a story in order or recalling details, start with 3 or 4-step story sequences on the Story Side. When I used the Fun Deck with my group of 3rd grade students who had difficulty with auditory processing last week, I started with the 4-step story sequences because I knew this would be a great starting point to get them used to the layout of the deck. My students were able to recall character names and place the events in order. When I stepped it up to 5-step sequences, they were able to recall character names, but had slight difficulty placing events in order as a couple of the events were similar (especially in images). Therefore, I know exactly where to start with them next year when I use this Fun Deck! 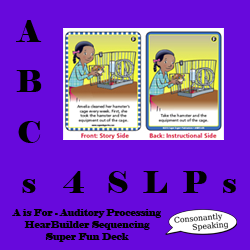 The HearBuilder Sequencing Super Fun Deck can be used in language groups who are working on auditory processing and recalling information from stories; however, if you have a group of students who are working on expressive language, articulation, or fluency as well, that doesn't mean you cannot adapt this deck! For students working on expressive language skills, have them tell a story to go with the pictures that is different from what is on the cards. Also, you could even have them write the story in order with or without the use of a graphic organizer. Students working on articulation or fluency can read the stories aloud to work on intelligible speech in sentences. This Fun Deck also comes with its own ideas in the instructional booklet with game ideas. These include Sentence Shuffle (where you can scramble words from the sentence on the card and have students place the sentence back in order) andWhat's Missing? (where you can take one of the cards in the sequence out of the deck and have students try to figure out what is missing from the story). I absolutely recommend the HearingBuilder Sequencing Super Fun Deck for speech-language pathologists who have multiple students on their caseloads who have difficulties with auditory processing, sequencing, recalling details from a story, or sequencing events in a story. This deck is great because it can be used with different age groups and students at different levels of learning these skills. Plus, you can adapt it to use in therapy groups with students who have different goals. I cannot wait to continue using this product next year with my students!